Hi everyone. Welcome to Kanji Time. Today, we are going to study N2 kanji. 参りましょう。(Mairimashō!) If you want to do the quiz first, please go to these times. These times. This kanji means drama, play, drastic, fast. The on-reading is ゲキ (geki) as in 悲劇 (higeki), meaning tragedy. あ～…。(Ā...) あ～…。(Ā…) Or in 劇場 (gekijō), meaning theatre. 劇 (geki), meaning play. 場 (jō) means place. Where the place for plays. 劇場 (gekijō), meaning theatre. This kanji means recruit, gather (contributions), enlist, get more. The on-reading is ボ (bo) like in 募集 (boshū), meaning invitation, recruitment. ピリッピ～。(Pirippī.) Good morning everyone, JapanesePod Radio です！(desu!) 私たちは今、日本語をしゃべれるナビゲーターを募集しております！(Watashi-tachi wa ima, Nihongo o shabereru nabigētā o boshū shite orimasu!) 応募はこちらまで！(Ōbo wa kochira made!) Bye! And the kun-reading is つの (tsuno) like in 候補者を募る (kōhosha o tsunoru), which means to accept application. Thank you very much for watching. 勇気をもって、行きましょう。(Yūki o motte, ikimashō.) エイ、エイ、オー！(Ei, ei, ō!) Bye bye. See you next time. This kanji means drama, drastic, pla- +plastic, drama, play, drastic. Mecsicacy… 絶対違う。(Zettai chigau.) 絶対違う、もう。(Zettai chigau, mō.) Efficacy. パカラッパカラッパカラッ。(Pakara, pakara, pakara.) Freedom! 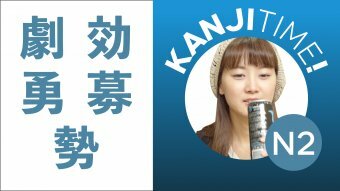 Want to master ALL Kanji? Click "here."